Another one of Owen's birthday presents was a book of science experiments and some of the ingredients needed to do them. It's been fun looking through the book and figuring out which one we want to do next. So far we've done the fireworks in a jar and the Mento Geyser. Excited to do the Mento Geyser...or as Owen kept calling it, "Metro Geyser". I think someone's seen Megamind too many times! Jack was pretty stoked too! It actually lasted longer than I thought it would. There was barely any soda left in the bottle. That didn't stop us from drinking what was left. We also ate the Mentos too! The funny thing that I wasn't expecting was that the soda was totally flat! I figured it be less bubbly, but nope it was absolutely flat! So if you like flat soda and don't want to wait just drop was Mentos in the glass....don't forget to stand back though! We Don't Believe In Gun Control....Nerf Gun That Is! On MLK JR day we headed to the mall and to let Owen use two of his birthday presents...a gift card to Target and some cash. He ended up picking out this bolt action dart gun. It's not actually Nerf....it's some other brand. You can pump it up so the dart will shoot farther and the best part is it has a scope with the cross hairs!!! Owen has wanted one of those for a LONG time. It was only $17 too! Daddy has been having some fun shooting with it as well! He's just a big kid! Did I mention he was shooting as a pink cup on his son's head! Owen is amazing and super trusting. He didn't even flinch or close his eyes!!! Yeah Daddy wasn't so trusting!!! He ended up not being able to watch at all. Of course Owen nailed him in the head a few times and then Daddy was done! This little guy is totally loved! He almost always has someone in his face kissing on him. And he's already annoyed by it! You know girls...we have cooties! How Much Is That Baby In The Box? How much is that baby in the box??? I do hope that baby's for sale! The one with the mischievous grin! I do hope that baby's for sale!!! Wednesday was brutal at our house. This mama was in a mood let me tell you. Also the 3 older kids were SO argumentative. The constant fighting and crying and yelling was making my teeth hurt. By the time we were supposed to leave to go to The Y there was NO WAY! I texted Michael and said we weren't going. Of course this started a whole new round of arguing and tears because we were supposed to go and heaven forbid we change the schedule. By the time Michael got home and we sat down for dinner I had about had it. I was being pulled in so many directions and being talked to by more than 2 people at once and I couldn't take it. I admit it I yelled and slammed my hands down on the table. It wasn't pretty! After dinner Zeke and I headed to Fred Meyer's and then I stopped at Mcd's to get a McFlurry and things started to look better. You know the best thing about small children....their willingness to forgive! They aren't tainted by the world yet and they don't hold grudges! I apologized and they forgave me no questions asked. Another wonderful thing I love....tomorrow is another day! A fresh new start!!! On Thursday I vowed to make it a better day. Not by giving into their every whim and trying not to rock the boat, but by keeping my cool and parenting my kids without letting myself become one! First stop was Wal-Mart to do an exchange and pick up a few things and then it was onto The Supermall. He looks happy here, but this little guy was past his nap time. He was only happy when he was chewing on Jack's dinosaur cup. We haven't played at The Supermall in months so it felt new for the kids. Owen and Jack made some nice friends. Two other boys that were their ages. They got really into chasing each other, growling and pretending to claw each other...you know boys stuff! Halfway through playtime we had to take a potty break for Ella Bean. Owen was upset and wanted to stay while I took Ella potty. Yeah...not happening! Thankfully emotions were kept at bay and the other boys were still there when we got back from the bathroom so Owen and Jack were still able to play with them. I tried introducing Zeke to the toys, but he was so far gone. I ended up just having to put him in his car seat and he had to cry himself to sleep. Once the kids started getting a little hungry it was time to make our way to Auntie Anne's. Of course they had to stop and check out all the ride on toys. I never bring any money, but they still like sitting in them and pretending. After eating our Pretzel Dogs I called Ga-Ga to see if we could come have lunch with her. Lunch at Ga-Ga's and then it was time to come home and do school. It was a nice getaway from the normal everyday. It is a little hard with homeschooling and watching Logan. 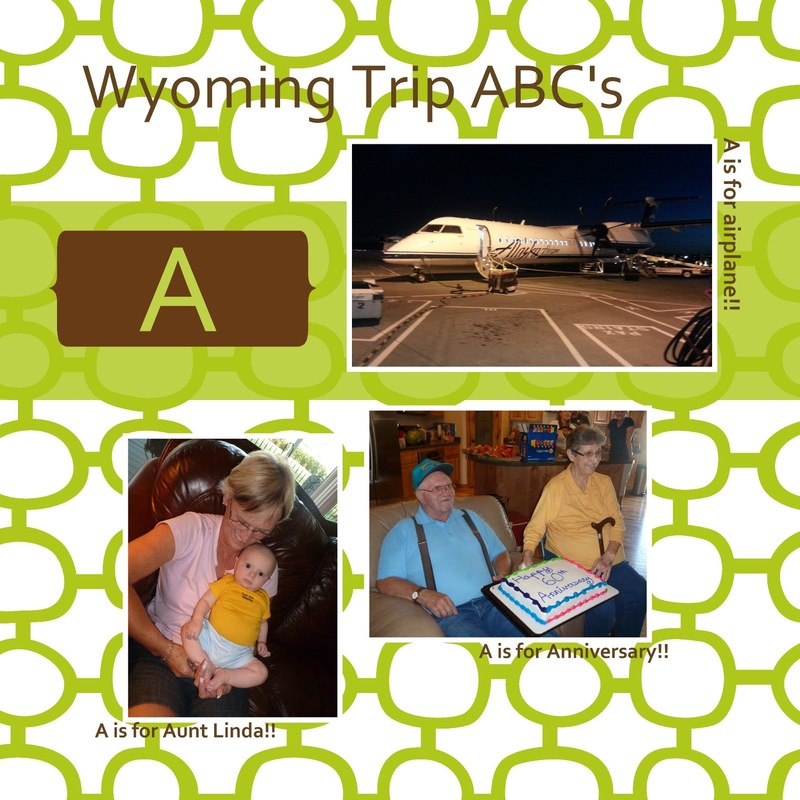 This week Logan was with her grandparents for the week. We needed this though and I need to try to do things like this more often. It was fun doing my first giveaway...hopefully I'll get to do another one soon! Can't wait to see the beautiful projects Ellen comes up with. I thought it might be fun to show you other ways the My Memories Digital Scrapbook Software can be used. 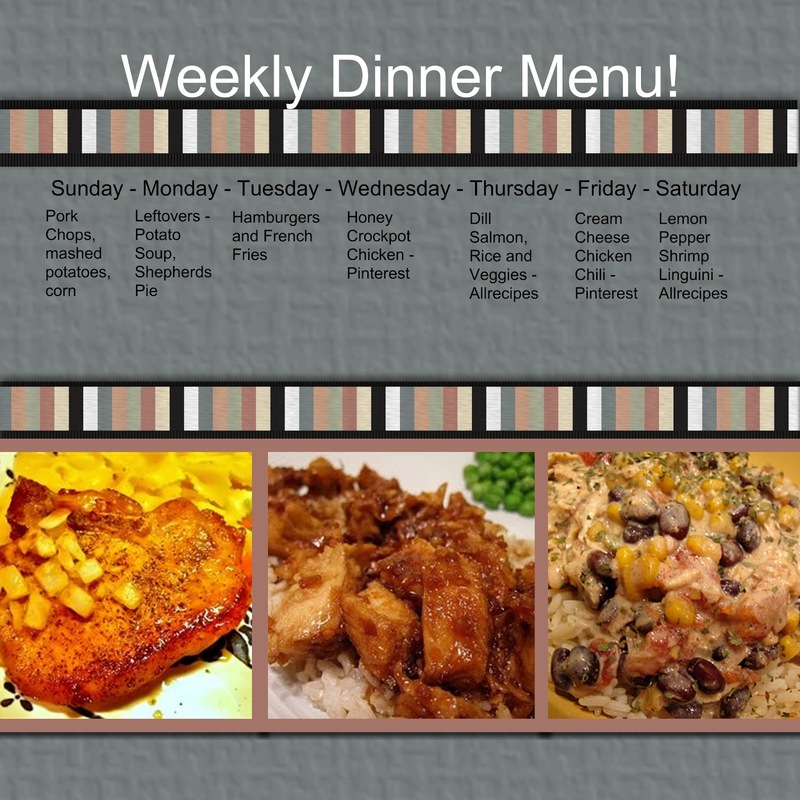 This time instead of creating a scrapbook page I decided to make a pretty weekly dinner menu. Since I find a ton of my recipes online it was fun to be able to add pictures of the yummy dishes I plan to make for the week. I'm hoping that might actually encourage me to make them instead of being lazy and saying, "Ummm....let's have pizza!" We'll see if it helps!!! 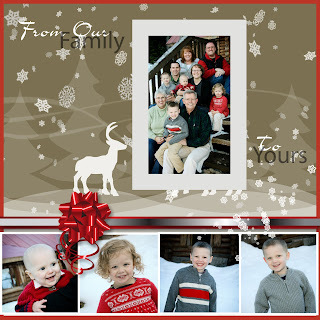 Remember the My Memories Digital Scrapbook Giveaway ends on Wednesday at noon. If you'd like to enter do the following..
1. Visit the My Memories website and leave me a comment letting me know which Digital Scrapbooking Kit is your favorite. 2. To get extra entries into the giveaway you can follow My Memories on their blog, facebook and/or twitter and then comment that you've done so. You can enter until Wednesday, January 23rd at midnight. The winner will be announced on Thursday. My Memories Suite Review & Giveaway!! A little more than a week ago I opened my email to a wonderful offer. An employee of My Memories had found my blog and loved it and wanted to share the award winning digital scrapbooking software with me! To say I was excited was an understatement. 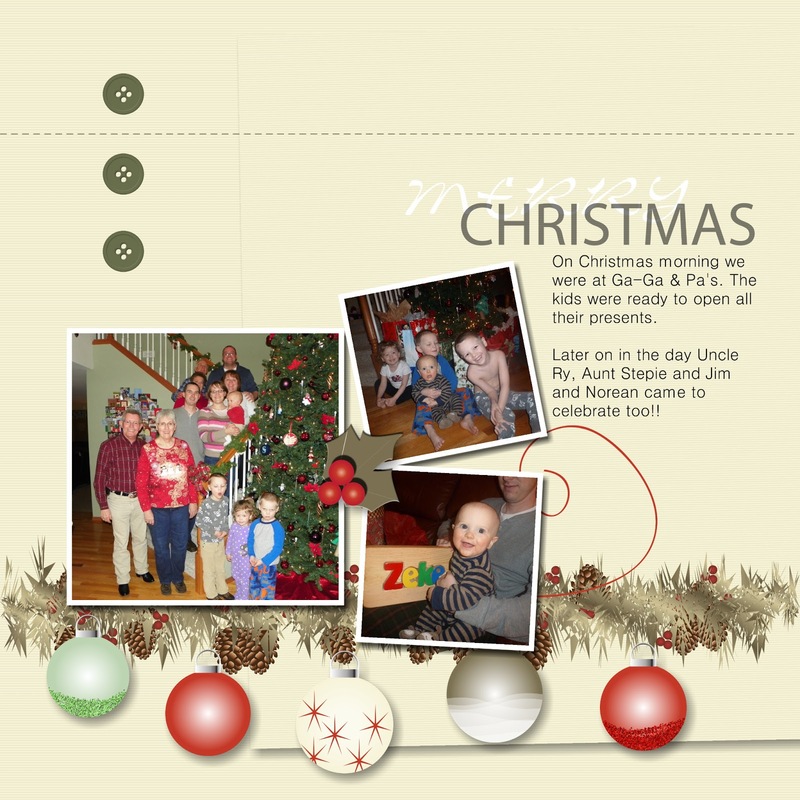 I've been wanting to try digital scrapbooking and now I was going to get my chance! I jumped right in feet first and created 6 pages that afternoon!! When I first started playing with the program I started where I think most people would start...with the designer templates. One of the first things I noticed and liked was that I didn't have upload ALL my pictures in order to insert them into my scrapbook. I've created photobooks before online and I had to upload so many pictures it was so time consuming I hated it. This program you just insert the pictures you want when you want them. The first 6 pages I made were for Christmas since it was fresh in my mind. This was my first page...the only thing I added were the buttons and the stitching on the top. This program has TONS and I do mean TONS of embellishments to use. I still haven't even looked at half of them. I'm absolutely in love with this page!!! 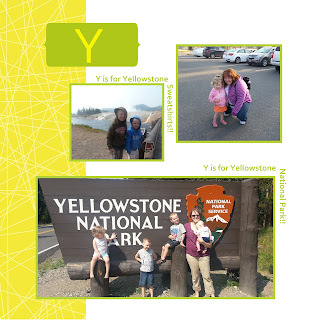 The template didn't include a space for the picture on top, but that's another wonderful thing about the program you can customize the templates however you want to. After creating the 6 pages for my Christmas album I decided to work on the kids scrapbook from our Wyoming trip. 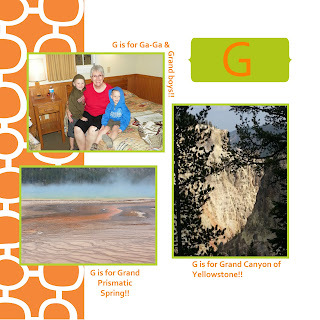 Since that was our first really big trip as I family I wanted the scrapbook to be kid friendly so they could flip through it and enjoy it. So I decided to do a scrapbook around the ABC's. I worked on a 26 page scrapbook just a couple hours a day and I had it done in about 4 days. All without ever having to print pictures and cut them, use any adhesive, spread paper and other scrapbooking paraphernalia all over the dining room table only to have to put it away after about an hour so the kids won't get into it and so we can eat dinner! Pure awesomeness!!! After using the program for some time the only thing that I wished was a feature was where you could click on a box to set the text to be the same for all the text on that particular page. They do have a feature where you can set the font and the size for the whole scrapbook, but I think it would be nice if it were per page. Again I used a template for this one...it's called Looking Back and it's a Family album. I love the bright colors. Overall I found the program very user friendly and easy to figure out by just playing around with it. I'm sure I still have things to learn, but I've only been using it for a little over a week. I am already excited to start working on the next bit of scrapbooking I need to do. Another wonderful thing is it's super easy to export the pages and then upload them to Costco for printing. Here comes the giveaway part....I have been given a free copy of the digital software to give to one of my readers. You're going to love it! Not only is he 6...he now has an adult tooth growing in. Soon he'll going to college...somebody hold me! I have wanted to make a treasure chest cake for a really long time so I was super excited to get to make one for Owen's party. Little did a know that it would turn into a disaster! First off I waited until the cake cooked, but I forgot to put it in the freezer to make it a little more stiff. When I took it out of the pan it was so moist it was already falling apart. Here it is all decorated. As you can see the front of the cake is already drooping. I use a piece of cardboard wrapped in tin foil to be the base for the lid of the chest and then the lid was propped up with pretzel rods. Again the cake was so moist it was just falling apart so the lid of the chest cracked! Owen's birthday party was on Sunday after Zeke's dedication. It was a pirate theme. The centerpiece was our Imaginext Pirate Ship, a treasure chest and a bunch of 'gold nuggets' aka Rolos. I made some cute food labels for the food, but I forgot to take picture of them. The main dish was meatballs that were labels 'cannonballs'. The grapes were labels 'jewel's' and I had a bowl of Doritos and goldfish crackers mixed labeled 'fish and chips'! One of my requests for Michael was for him to make a pirate ship out of cardboard. In my mind I was thinking 2 dimensional...of course he just blew me away with his creativity. And it only took him about a half and hour to make it! Kids posing with the pirate ship....Arrrr Matey!!! The first game was throwing 'cannonballs' aka water balloons at the pirate ship. Love Caleb's form here! This was his second throw though...the first one ended up hitting me in the foot! It was hilarious! These cute girly girls were hilarious to watch. They wouldn't just throw the balloon they had to walk up as close as they could get...such girls! Kendra and Cameron ended up winning this game and they got 'cannonballs' aka Whoppers! On to the next game...walking the plank! We just let the kids jump off the plank and then marked the spot with chalk. Owen and Jack were the ones that jumped the farthest so Christina (Caleb's mom) and I helped Lilyann cheat so she won that game. Her prize were these cool rocket darts. Then it was time for the treasure hunt! I had made up 12 different treasure maps with directions to their treasure chest. John was getting help from his parents! Andrew found his treasure chest behind the macaroni and cheese in the pantry! I bought the black treasure chests from Oriental Trading Company and filled them with a telescope, a ring pop and chocolate gold coins. Jack found his treasure outside under one of the blocks from the retaining wall. Kendra's was inside the tire swing! Caleb found his behind the play kitchen....and he's already enjoying his treats here!! After the treasure hunt it was time for cake. Here is Owen's ice cream cake. Of course I had a whole treasure chest cake idea in mind and....it COMPLETELY failed! After church Michael had to run to DQ to buy this cake. Michael said, "Well you can't be good at everything hon!" At Christmas I got each of the kids a Duplo set and they have really been enjoying them. With each set comes an instruction booklet that shows other sets. Owen saw the Cars set and really wanted it so Ga-Ga and Pa got that for him. I love Ella's face...she is pretty stoked too! Ga-Ga and Pa also got him a Lego stationary set. Owen has turned this into his drawing book. He's been drawing pictures and then I write what he's drawn. He's really turning into quite an artist! Miss Kim got hims Monopoly Junior Party Edition. It's such a cute game...we've already played it a few times! From Uncle Jon & Aunt Becky he got some money and from Miss Angie and Mr Kevin he got a gift card to Target! Owen also got an air hockey game from Cameron, a science book and all sorts of ingredients to do experiences from Caleb and a ton of Gears from us. Once most of the party people were gone our living room transitioned into a wrestling ring! Zeke enjoyed the wrestling from the sidelines! Thank you to everyone who came out and celebrated Owen turning 6! It's Time For A Shave!